The summer of 1983 saw big changes at Turf Moor. With the appointment of John Bond it meant that for the first time since Frank Hill, who left the club in 1954, the Burnley manager hadn't previously played for the club. There was also another big change. Previous manager Frank Casper had released goalkeeper Alan Stevenson at the end of the 1982/83 season. 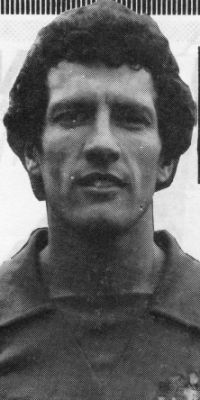 Stevenson had been first choice for virtually all of his eleven and a half years at the club and was only one short of equalling the club's post-war league appearance record. That meant a new goalkeeper had to be signed with only Billy O'Rourke, who had played ahead of Stevenson for the last few games, on the playing staff. New manager Bond did what so many new managers do; he went and signed a goalkeeper who had played for him previously. He turned to 28-year-old Roger Hansbury who had started his playing career over a decade earlier at Norwich when Bond was in charge there. The Barnsley born goalkeeper had the obstacle of Kevin Keelan in front of him but did make a total of 78 league games for them before departing for Hong Kong in 1981. During his time at Norwich he went out on loan to Bolton, Cambridge and Orient. He failed to make any appearances for two of them but did play eleven times for Cambridge during the 1977/78 season. With Norwich signing Chris Woods from QPR in the summer of 1981, Hansbury opted for a move to Hong Kong at a time when a number of English based players were making similar moves; his choice of club was Eastern Sports Club for whom he played for two years. He was there until getting the call from Bond and he became the new Burnley manager's first signing in the summer of 1983. His debut for the Clarets didn't go well. He conceded four goals in a 4-1 defeat at Hull on the opening day of the 1983/84 season when he was one of four debutants alongside Joe Gallagher, goalscorer Kevin Reeves and Tommy Hutchison. Never popular with the Turf Moor crowd, Bond stood by him during that season when he was an ever present. The Burnley fans saw him as a poor replacement for Stevenson, particularly dealing with high balls into the box, and even Bond realised he would need to do something about it before the next season. That led to the signing of John Turner in 1984, a goalkeeper I'm sure many Burnley fans won't even recall. He'd previously been at Derby, Doncaster, Brighton, Huddersfield, Reading, Torquay, Chesterfield and then, for the last two months of the previous season he'd been at Weymouth. He was destined to be first choice for Burnley and played in two of our pre-season Lancashire Cup ties, but then, on the eve of the season, Bond was sacked and replaced by his assistant John Benson. Benson, however, didn't want Turner in his team and moved him on to Peterborough in the October with the Posh needing a replacement for David Seaman who they had just sold to Birmingham. That meant Hansbury was first choice for another season, one that would end disastrously for Burnley with relegation to Division Four. He was in the side for the first half of the season but was left out in January when Joe Neenan arrived in a loan deal from Scunthorpe. Neenan played nine league games before returning to his parent club which left Hansbury to come back in for the remaining 14 games. He was in the side that won at Walsall on the last day of the season to give us a chance of avoiding the drop, but he was then released. He played for a number of clubs after Burnley. He signed for Cambridge, and played for them in our 4-0 win at the Abbey Stadium in November 1985 He then rejoined Bond at Birmingham. During his time there he had loans at Sheffield United, Wolves and Colchester, and he finally signed for Cardiff, his last club, where he made 99 league appearances, that being more than at any other club. His last season at Ninian Park was 1991/92 during which he played in once more at Turf Moor in a game the Clarets won 3-1 with goals from Robbie Painter, Andy Farrell and Mike Conroy. I don't think he was the worst goalkeeper to play for us on a regular basis by any means, although I'm sure some would argue that. One thing for certain was that he was never a popular goalkeeper with the Burnley fans and there was no disappointment on the terracing when he left.